This weekend has been a rather interesting weekend. First I bump into a friend who tells me they struggle with their Vlog. Please check it out. Something I am very familiar with with regards my blog, having struggled for a long while to find anything interesting in myself to blog about, I can understand the frustration with putting something out there and not seeing anything for it. Letting go of caring was a big step in that regards. Letting go of some dark demons was another, more important one. Writing about my experiences with depression has really changed my own self-perception. Back in University, I used to write little nonsense stories and poetry, but at some point, that just became too hard. Then it became too hard to write about anything. I told myself I wasn’t interesting, and that nothing I could write about would ever inspire, entertain, or even touch another person, so why should I bother. I stayed like that for a number of years, something I will touch upon sometime in the future. Then I become aware of a number of happenings (and almost happenings), in my immediate circle, and in the world in general. Several people’s experiences set me down a path of personal revelations, and honesty. 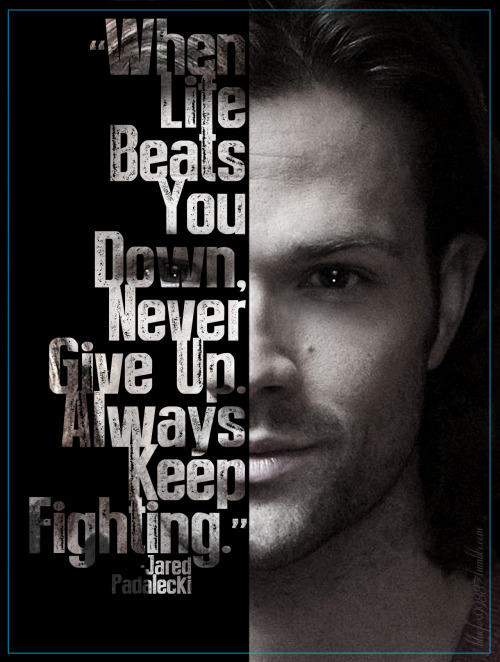 The final key in the lock was that of Jared Padalecki and his campaign to raise awareness for suffers of depression. His “Always Keep Fighting” movement motivated me to write, and boy, did I write. And I haven’t really stopped. While I have reached a turning point in my story, it is not the end. There is more, yet out of respect for those closest to me, I am holding back for now. The second thing to happen was to hear that Jared had suddenly excused himself from a convention under questionable circumstances, with some equally concerning tweets. Then today, I read an interview of less than a week old, where he opens up about his clinical depression. The man who ultimately inspired me to open up did not only relate to people suffering depression, he was a suffer also. Depression comes in all forms. Unlike Jared, mine is not clinical. It has been brought on by environmental factors. What is does show is that no-one is immune to depression. It can affect us all in various ways, and in different degrees. For me, opening up and admitting, first to myself, then to others, was the biggest step for me. It has freed up so much in myself that had previously been locked. I cannot imagine the struggle others feel as they battle with their own self-identity, or their own private demons. I have had, and continue to have, my own, and depression is a very personal experience. The difference for me between where I was to where I am, is I no longer write for others. I write for myself because it serves a process of healing and strength for my soul. For others, it may, and will, take on other forms. Yet I believe that the pursuit of PERSONAL satisfaction in whatever you do is a most important tool in managing the darker aspects of human nature. In order to change the world, start with your own perception of it. Start with yourself. As a side note, in addition to this weekend having some interesting stories about identity and depression, it has also been a weekend of achievement. Three commercials rough-cut for review, and show reel for a talented young presenter, and a near disaster for the last episode for a web-series which was plagued with mishap after mishap, yet all achieved by Sunday morning, leaving me the rest of the weekend to rest, watch Supernatural, and eat copious amounts of junk food.